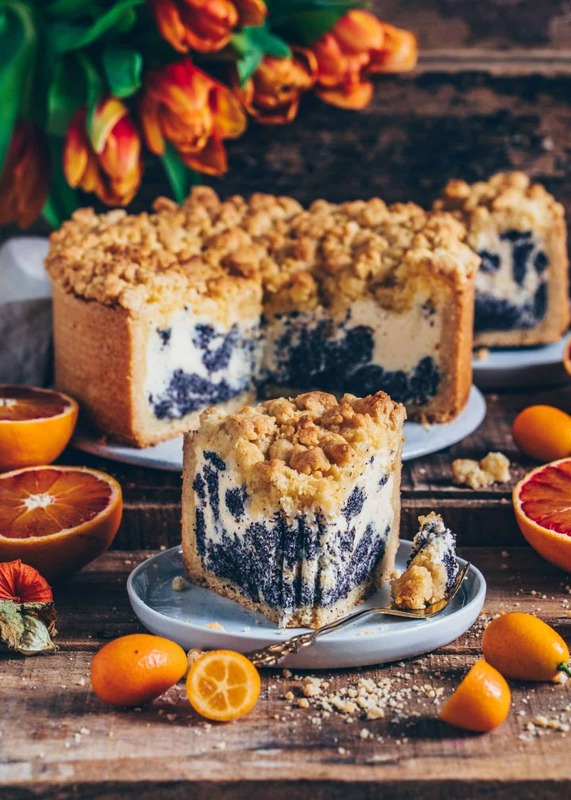 This Poppy Seed Crumble Cheesecake features a Cheesecake layer with dollops of a poppy seed filling into one delicious dessert! It tastes absolutely amazing and you’ll love how easily it can be made too! 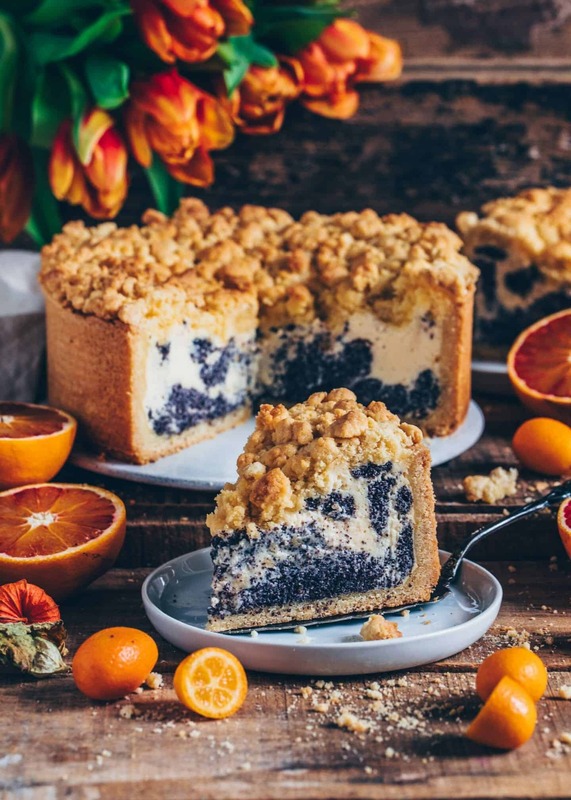 If you’ve never tried adding poppy seeds into your desserts, now is the perfect time to change that! 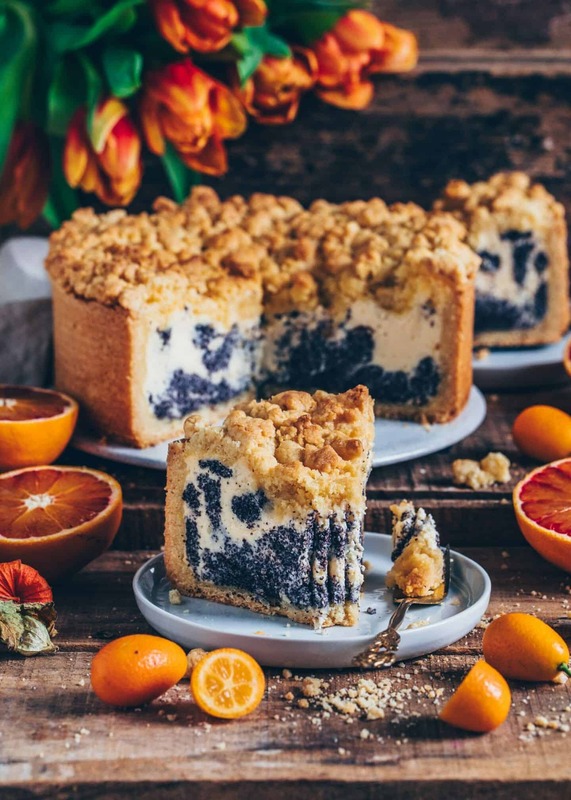 This Poppy Seed Crumble Cheesecake will definitely become an addiction. 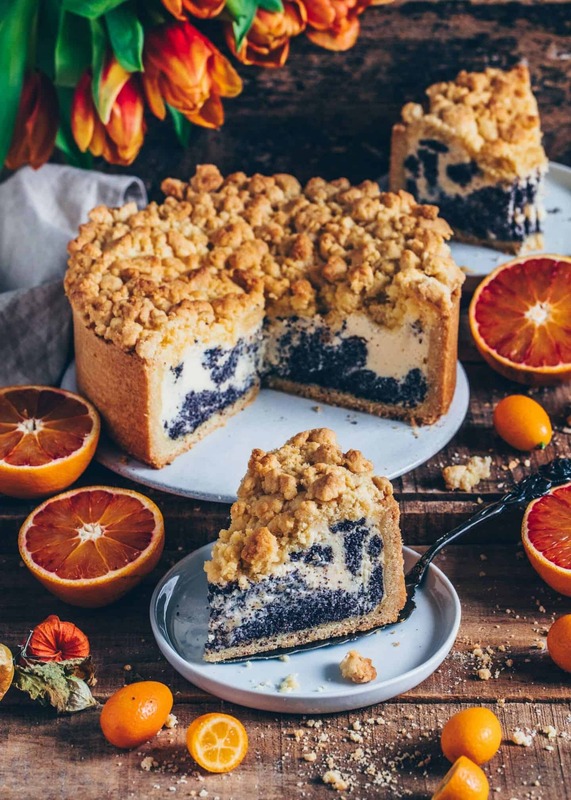 Not only because of the Poppy Seeds but also because the combination of a Crumble Cake and Cheesecake is the best ever! Honestly, I‘m one of those people who can never decide between two things (or three or four or even more, haha!). 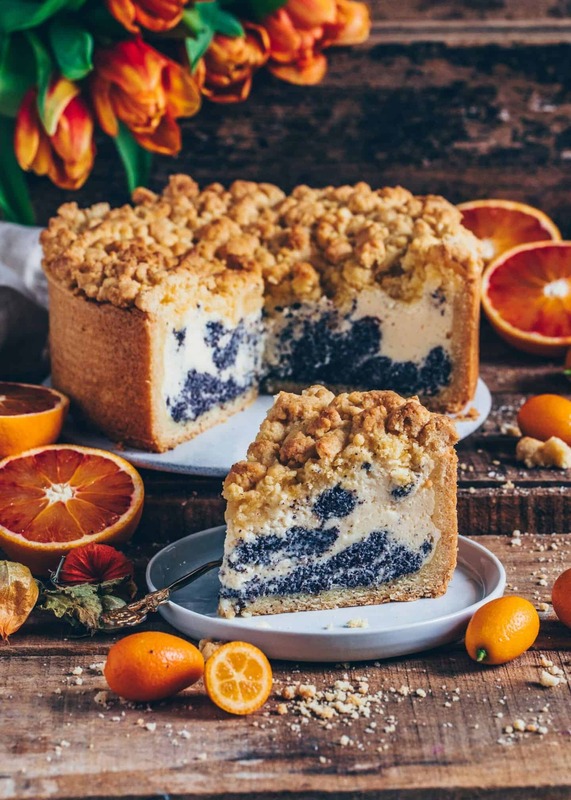 That’s why I prefer to combine my favorite desserts – a Crumble Cake and Cheesecake – into one delicious (this time) Poppy Seed Cake! Doing this definitely solves the problem of having to choose only one. I mean, is there anything better than having both? I don’t think so! 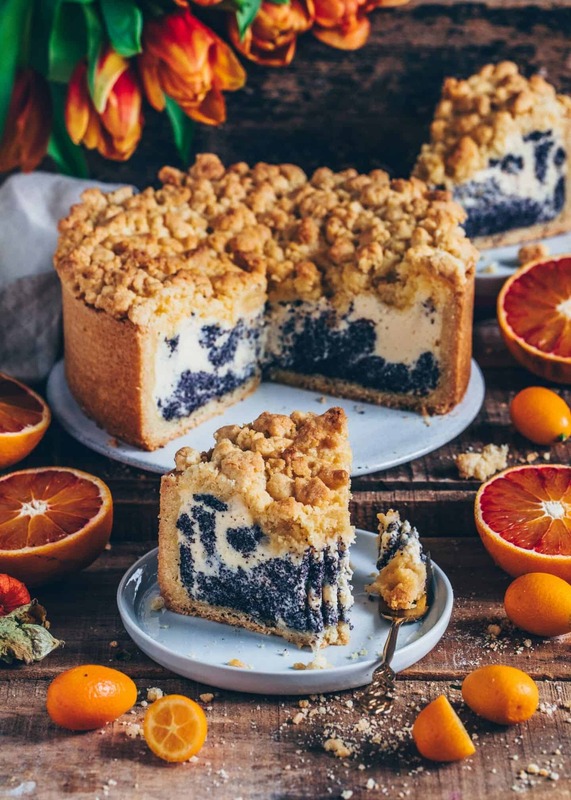 If you’re like me and you can’t get enough of these kinds of Cakes, you can find more Vegan Crumble Cake Recipes and Vegan Cheesecake Recipes here. Simply click on the words and it’ll link you to the recipes. This Cheesecake may look fancy, but, it’s actually very simple to make. All you have to do is make one batter and then just add the poppy seeds into 1/3 of this Cheesecake mixture. When layering, simply fill both mixtures in exchange into your prepared springform pan. It doesn’t have to look pretty or perfect, so don’t worry. 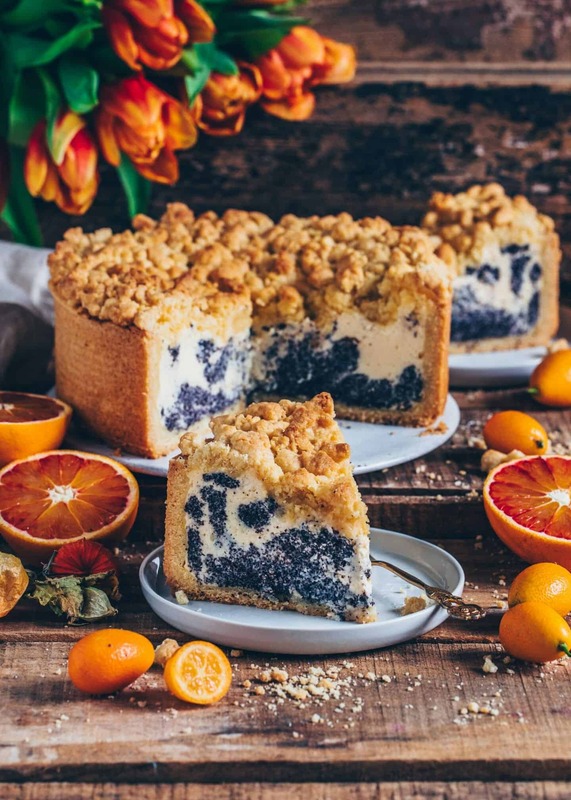 Just dollop 2-3 spoonfuls of the batters inside using 2 different tablespoons – one for the plain cheesecake mixture and one for the poppy seed cake mixture – until the mixture is empty. Click here to watch a visual picture animation of how I layered my Pumpkin Swirl Cheesecake ! It’s almost the same process. While Americans usually make a “New York Cheesecake”, mainly with cream cheese or sour cream, the Europeans make it with “Quark”. This is a kind of cottage cheese which is actually just drained yogurt, so it’s healthier because it contains less fat and less calories. You can easily make it at home (also vegan!) if you can’t find any in the supermarkets where you live. However, Tofu or dairy-free cream cheese are good alternative options too. To make Quark simply fill your favorite yogurt, (such as coconut yogurt or soy yogurt) in a strainer lined with a cloth and let drain for 12 hours. If using 2,2 lbs (1 kg) yogurt, it should make about 26,5 oz (750 g) quark. For the Crumble Cake, I used my basic recipe, which, incidentally is made in mere minutes. I used the same dough for the base and for the crumbles on top, making the preparation easier and faster. However, if this is still too much work for you, feel free to buy a pastry or use another recipe instead, if you have a favorite. Just make a note that it may alter the taste because to me, personally, this recipe suits this Poppy Seed Cheesecake perfectly. 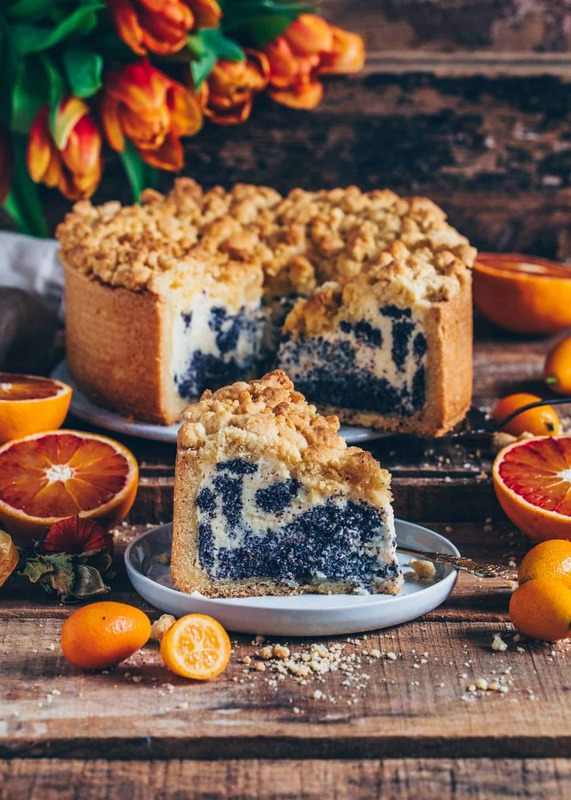 The perfect Cake for a cozy tea or coffee party or any occasion! 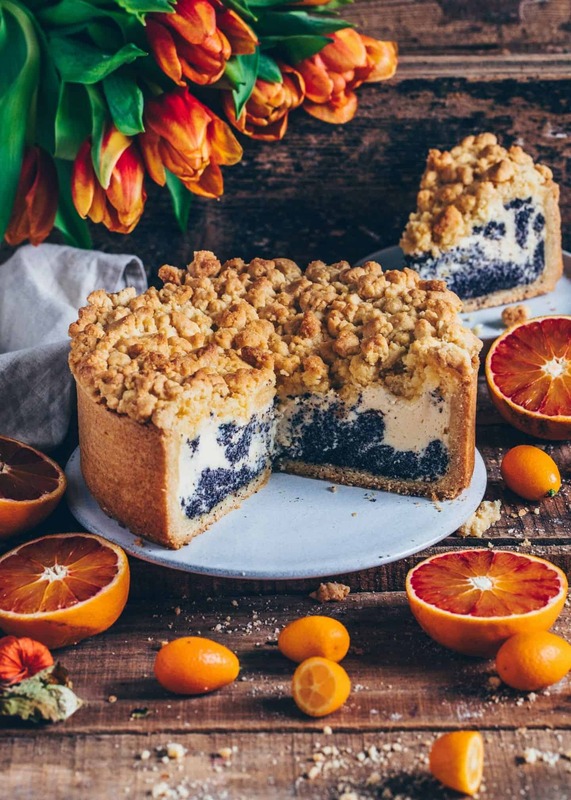 This Poppy Seed Crumble Cake features a delicious Cheesecake layer with dollops of a poppy seed filling, making it to the perfect dessert! Easy Recipe. Combine the flour, baking powder, salt and sugar in a bowl. Add the soft vegan butter along with the apple sauce (if using) and knead with your hands until a dough forms. Roll out 2/3 of the dough between two large pieces of foil (or on a lightly floured working surface). Then lay it into a greased 8- or 9- Inch (20/22cm) springform pan, pressing the bottom and sides. Using a fork, prick the bottom a few times. Add all ingredients for the cheesecake in a mixing bowl and mix until creamy using an electric hand mixer. Fill 1/3 of this mixture in another mixing bowl. Add the ground poppy seeds and mix until well combined. (Add a bit of yogurt or milk if it’s too firm). 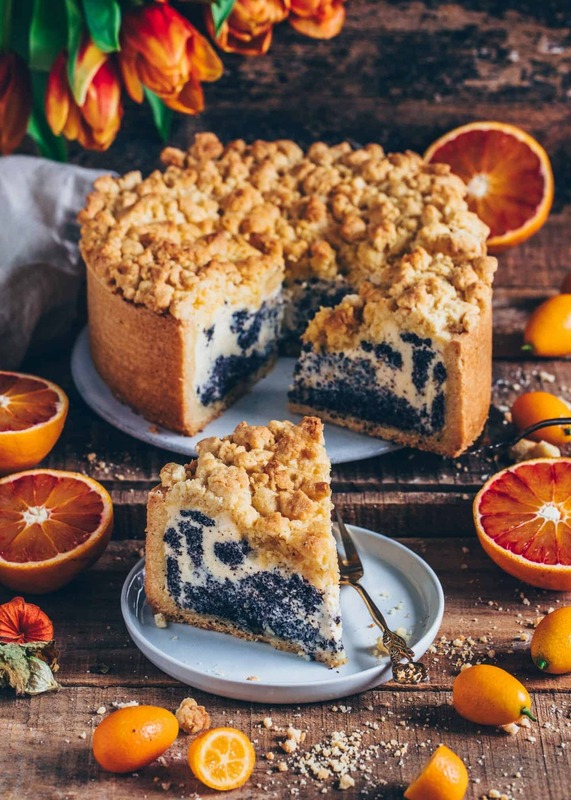 Add the plain cheesecake mixture and the poppy seeds mixture in exchange into the prepared springform pan with the crust inside. (Click here to see a step-by-step picture animation how I layered my Pumpkin Swirl Cheesecake). 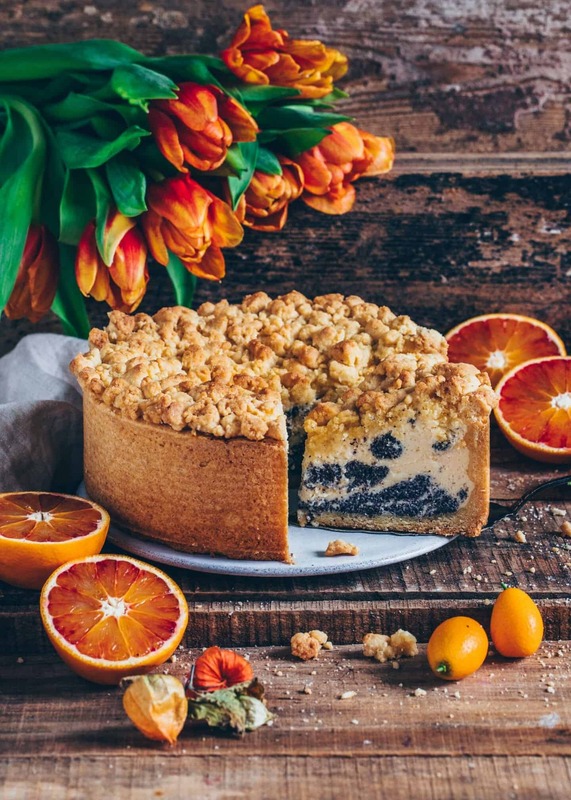 Bake for about 25 minutes, then remove and crumble the remaining 1/3 of the dough as streusel over the cake. Put it back into the oven and bake for a further 30 minutes. Once cooled to room temperature place in the fridge to set for at least 2 hours before serving. You can also turn this cake into muffin tins or bake it on a baking sheet. If you do not find any dairy-free quark in the supermarket, you can make it yourself. Simply fill about 2,2 lbs (1 kg) of dairy-free yogurt in a strainer lined with a cloth and let drain for 12 hours. That should make approx. 26,5 oz (750 g) of quark. Also, you could also use half amount of dairy-free cream cheese and half amount of dairy-free yogurt, or use tofu. 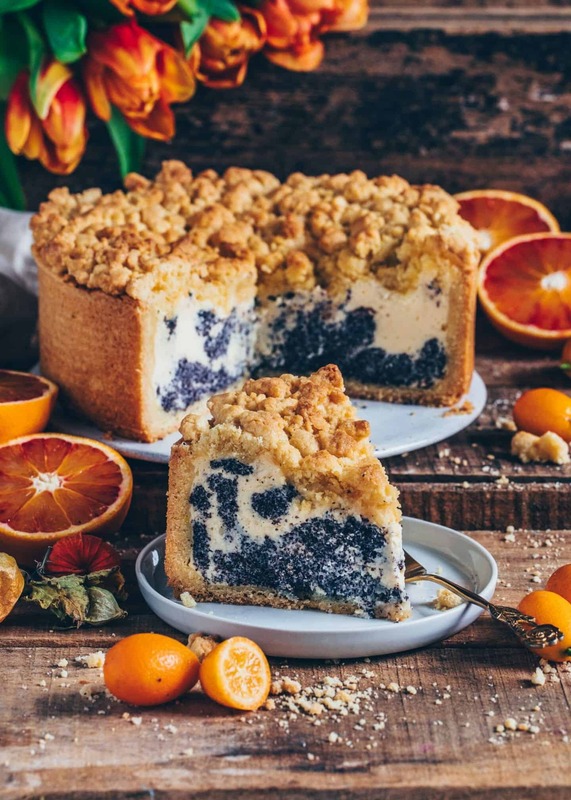 If you're not vegan, you can also use regular dairy products or adding an additional egg to the cheesecake mixture which makes the filling more airy. You can also use flavored soy quark or yogurt (I personally like Vanilla soy quark). If it’s already sweetened you should add less extra sugar into the Cheesecake batter. If ground poppy seeds are not available where you live, you can also push the poppy seeds through a food grinder or grind them in a food processor. I recommend to soak them in hot water before (for 30 minutes at least) to soften. You can keep leftovers covered in the fridge for up to 4 days.